Vacancies and info about working at UCASU. See how we’re doing our bit for the environment. Links to all our social media channels. How to advertise with us. Recognition of accomplishments at UCA. How we use our visual identity. Student-written policies we keep to. How to make a complaint about the Union. The legal bit about this website. Meet your President and Vice-Presidents and read what they’ve been up to. Course Reps are elected from each year group on every course at UCA to help improve the learning experience of students. Could you be one of them? Find out how we’re working to support, empower, and network our Women, Disabled, BAME, and LGBTQ+ students. Every year we hold an All Student Meeting to report on our work and give students the chance to directly impact what we do. The Trustee Board is the highest decision-making group in the Union, ensuring the organisation is financially secure, and is headed in the right direction. The UCA Student Charter is a series of promises that the university has made to students, and what it expects in return. A guide for International Students settling into the UK. What is the Union? How can it help? Top tips, and what to do upon arrival. Get started in volunteering while at university to help others and enhance both your experience and CV! Our movement to help students and staff at UCA stand in solidarity with our diverse community. Find out everything you need to know if you’re thinking about running for election, or just curious. See the details of everyone running in the elections, along with a guide about how voting works. Check out the results from previous elections, including manifestos of the candidates. We offer advice and support across a wide range of topics. A handy form for reporting any issues you may be dealing with. There is also the option to report anonymously if you need to. Important information on housing, including tenancy agreements, house viewing checklists, and tenant rights. Each candidate is responsible for the actions of themselves and every member of their campaign team. Therefore a candidate may be penalised for actions by their team that they are unaware of – it is the candidate’s responsibility to ensure all their team know the election rules. Candidates should not break the law or any University policies such as the UCA Bullying and Harassment Policy. All candidates / teams must let students cast their votes without pressure, if a student needs help they should ask a member of Union staff. Candidates cannot cast votes on behalf of others. All votes will be cast online, any electronic device which can be used to vote will be classed as a polling station. Candidates must not interfere with any ‘polling stations’, and cannot use their own devices for students to vote on. Candidates or their team should not interfere with/remove/change other candidates’ promotional material. Candidates should not bribe, impersonate or harass any student during campaigning. Candidate’s should be mindful that there are 4 UCA Campuses and students from all campuses can vote in any full time officer, NUS Delegate and Student Trustee Election. UCASU and its staff cannot endorse any candidate and serve to ensure the election is run freely and fairly. All full time officer candidates must attend a candidate briefing before they are eligible to run. If you are unable to attend at the set times you must let the Deputy Returning Officer know with 24 hours’ notice on [email protected] for it to be rescheduled for you. Candidates who already hold a position within UCASU may not use union time or resources to enhance their own campaigning or that of another candidate. The election will be conducted in accordance to the Election By-law, which the Returning Officer shall be the final interpreter of. Manifestos must comply with any format requirements stipulated by the Returning Officer. – 1 A4 page. Candidates cannot campaign with other candidates in a team, or use shared physical resources (including online). Any candidate may withdraw from the election at any point by informing the Returning Officer. Any candidate or their appointed deputy may, if they so wish, attend the counting of the votes as observers only. The Deputy Returning Officer must be made aware of this 24 hours before the count is due to start. Any challenge or complaint concerning the administration and good conduct of the election shall be heard and determined by the Returning Officer within 24 hours of such a complaint being lodged by any full member or the candidate or their nominee. Any complaint against the conduct or administration of the election shall be received by the Returning Officer before the end of polling. No candidate may challenge the result of the election once the count has started. Any candidate who has an appeal lodged against them will be notified at the earliest opportunity. A challenge or complaint during or following the count, shall only relate to the conduct of the count, and shall be lodged with the Returning Officer who shall resolve the complaint within 24 hours of it being lodged. The Returning Officer will decide on the penalty (if any) of any candidate complaint, this can range from a verbal warning to disqualification from the election.The Returning Officer is responsible for the final interpretation of these rules and final decisions will lie with them. Deputy Returning Officer – Katie Badman, UCASU. Returning Officer – Tim Cobbett, National Union of Students. Campaigners should not break the law or any University policies such as the UCA Bullying and Harassment Policy. All campaigners must let students cast their votes without pressure, if a student needs help they should ask a member of Union staff. Campaigners cannot cast votes on behalf of others. All votes will be cast online, any electronic device which can be used to vote will be classed as a polling station. Campaigners must not interfere with any ‘polling stations’, and cannot use their own devices for students to vote on. Campaigners or their team should not interfere with/remove/change other campaigners’ promotional material. Campaigners should not bribe, impersonate or harass any student during campaigning. UCASU and its staff serve to ensure the election is run freely and fairly. The referendum will be conducted in accordance to the Election By-law, which the Returning Officer shall be the final interpreter of. The Returning Officer will decide on the penalty (if any) of any candidate complaint, this can range from a verbal warning to disqualification from the election. The Returning Officer is responsible for the final interpretation of these rules and final decisions will lie with them. To make a complaint, your name is required. This will remain confidential. If you have screenshots or photographs, please upload them. Accepted file types: jpg, png, gif, jpeg, doc, docx, xls, xlsx, tiff. 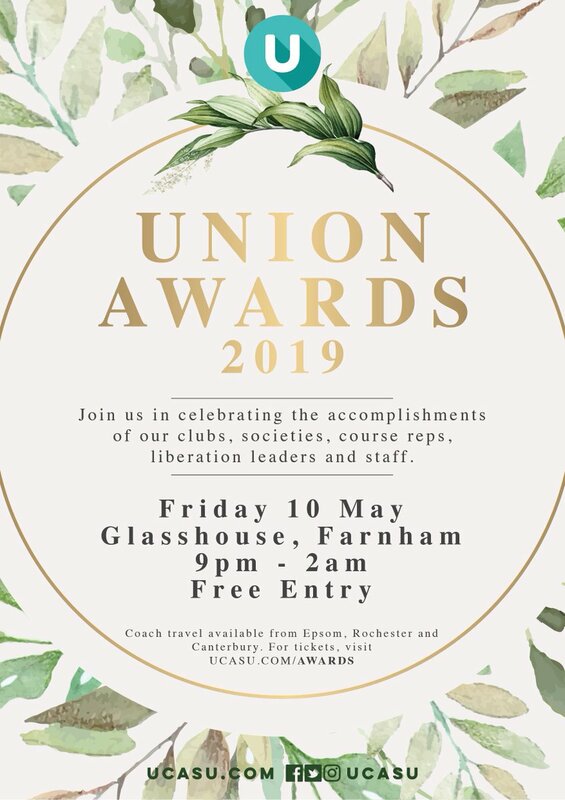 We are happy to announce the shortlisted nominees for the Union Awards 2019! Congratulations to those nominated in over 270 submissions on our website.